AUTOMOTIVE ART - The Bluebird Electric (BE1) is/was the first car to be able to exchange batteries itself with built in patented loading equipment, seen here on display at another famous Museum; the National Motor Museum - Beaulieu. 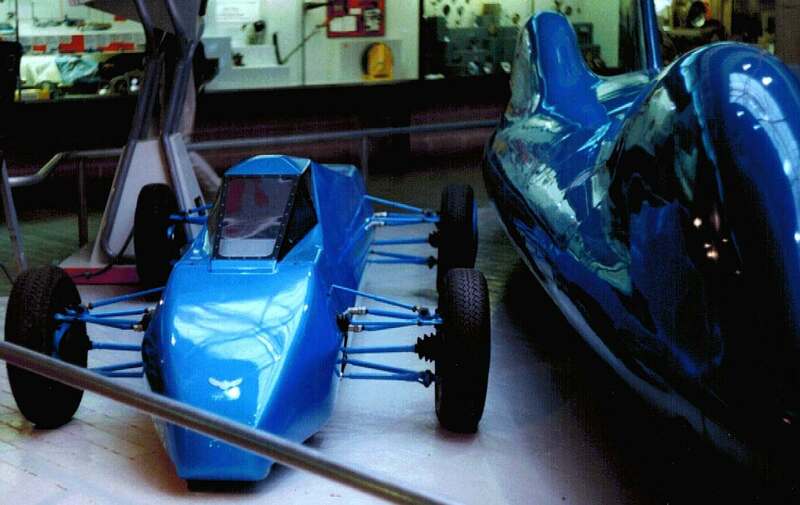 This car was driven by the grandson of Sir Malcolm Campbell for media articles, Big Breakfast TV, and at the LETEC Awards held at the London Arena, but not during any of the high speed runs on the Polegate Bypass where it achieved around 160mph using high speed motorcycle tires and Lynch electric motors, not the stop gap tires shown in the above pictures, about which some people have expressed confusion. The tires shown here were ordinary car rubbers on steel rims for delivery purposes only [left] and ordinary motorcycle tyres [right]. Thinner racing motorcycle tires with a circular 'V' casing were fitted on the same (but modified) alloy rims for high speed runs - and it is the faster wheels and tires that the car will be sporting when on display in the Campbell Hall fully restored. Electric vehicles have come a long way with lithium battery technology making them viable for short journeys where ranges of 100 miles are now realistic. But there is still a long way to go if we are to achieve a truly circular economy, other than one bolstered by fossil fuels, mainly oil for transport. Back in 1991 an idea was conceived and pen put to paper, or rather pencil put to the drawing board, and from then until about 1995, pioneering automotive design took place just outside of the little village of Herstmonceux in Sussex. Here, with basic tools and a high degree of craftsmanship, a car was built that could recharge instantly with a revolutionary "built-in" battery cartridge exchange system. Even today, some twenty-six years later (@ 25/04/17), the speed of exchange has not been rivaled and that includes the likes of Better Place and Tesla - both car companies promoting battery-cartridge exchanges for road cars. In those days it was lead-acid and nickel-cadmium batteries that weighed a lot; around 800lbs for one trial pack. The secret to the BE1 loading system was using compressed air in two pneumatic cylinders, or servos, each servo being placed directly over the axles, front and rear, so that the mass of the battery could be distributed in the most efficient way - placing less demand on the chassis and thereby making up for the extra weight of the battery cartridge and the loading mechanism itself - to some extent. Many modern EVs carry batteries in a way that is less load efficient, with a front of rear bias, where the frame of the vehicle has to be stronger and so heavier as a result. The BE1 achieved the perfect 50/50 balance with the driver providing a forward weight bias for directional stability. AIR LIFT SERVO - Regardless of any residual animosity between the designer and his former driver, the concept of a car that can change its own battery cartridges is ground breaking innovation and a legitimate performance enhancer even today. The pneumatic lifters will be on display outside and ahead of the BE1 car with the battery cartridge suspended from the lifting hooks (also the contactors). This is so that visitors to the museum can see how beautifully the exchanging mechanism was integrated in the overall design of the BE1. This is automotive art. 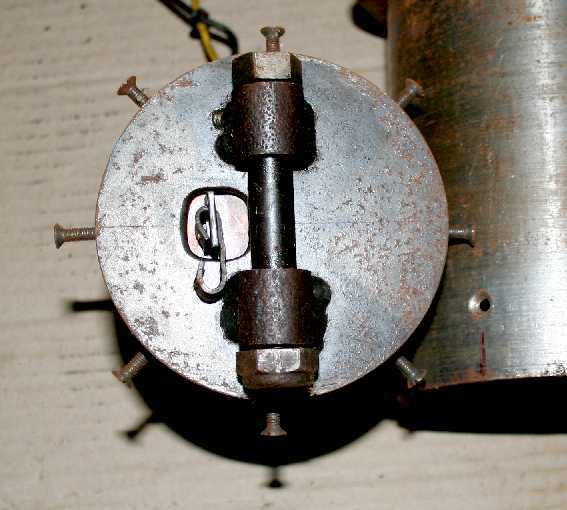 The mechanism had gotten a little rusty over the years and needed a makeover if to be put on virtual display. The BE1 was the first ever electrically powered Bluebird land speed record vehicle, with the BE2, the second. For this reason they are very important historic vehicles. 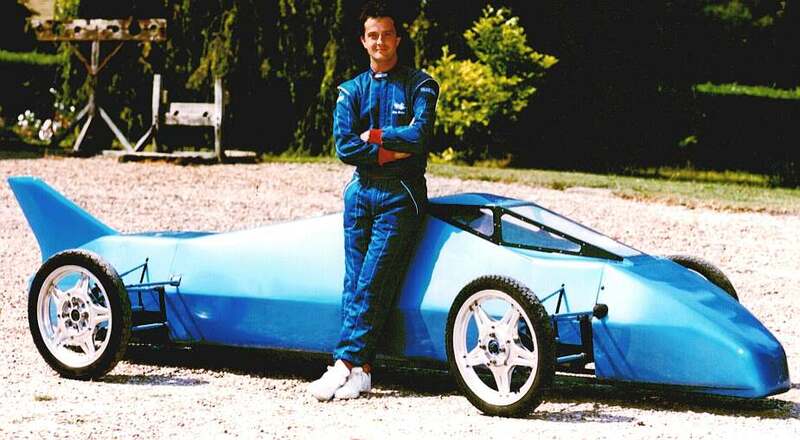 The BE4 is the world's first pre-production sports car to legitimately carry the Blue Bird legend and please note that we are using these trademarks with the benefit of a license agreement that give us permission to use the marks in connection with the virtual reality display and other cultural events or demonstrations, such as speed runs on the Pendine Sands at Carmarthen in Wales. 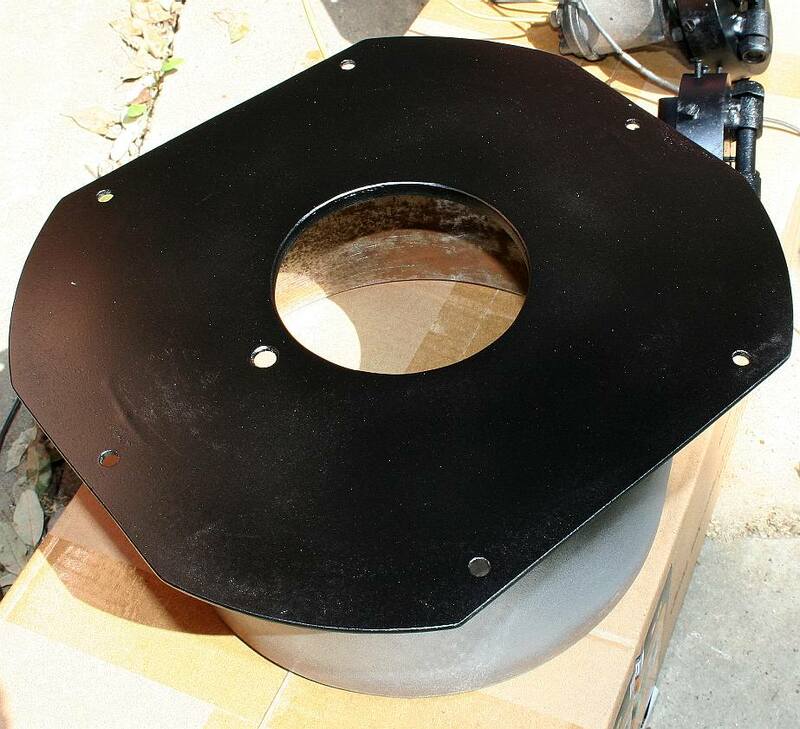 ASSEMBLY - The parts are seen here re-assembled after painting and other preservative treatments. Copyright photograph © 24 April 2017 all rights reserved. You will need the permission of Lime Park Heritage Trust to reproduce this picture except for education private study or review. FABRICATION - The central cylinder had to carry the battery cartridge when locked in place and lift and lower the packs, so needed to be strong enough to cope with 400lbs each and contain the hook disengagement solenoid actuator. These days that would be a motorized servo, so saving more weight and providing extra control and feedback to the vehicle operator. Copyright photograph © 24 April 2017 all rights reserved. You will need the permission of Lime Park Heritage Trust to reproduce this picture except for education private study or review. 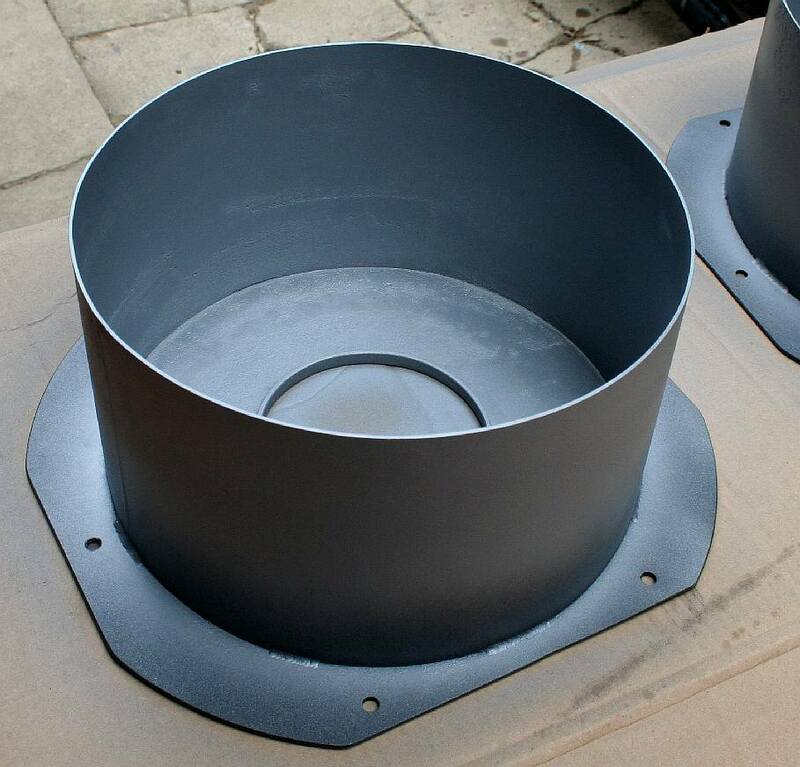 PREPARATION - The large steel cylinders were prepared, primed and painted with a good quality matt black paint. Copyright photograph © 24 April 2017 all rights reserved. You will need the permission of Lime Park Heritage Trust to reproduce this picture except for education private study or review. PRIMED - The steel components were lightly sanded to remove the surface rust and a corrosion inhibiting zinc/aluminium paint applied. Copyright photograph © 25 February 2017 all rights reserved. You will need the permission of Lime Park Heritage Trust to reproduce this picture except for educational use, private study or review. MORE TIG WELDING - These are beautiful TIG welds, made with the benefit of a skilled operator and a mechanically revolving table that has a floor mounted pedal. That way the welder can concentrate on achieving a perfect weld, and not have to move around the work piece. Copyright photograph © 15 April 2017 all rights reserved. You will need the permission of Lime Park Heritage Trust to reproduce this picture except for educational use, private study or review. TOO FAST - Cartridge exchanges were extremely quick with this system; almost too quick, taking seconds. But this was not a road car, where the mechanism is electrically powered and can be timed for between 15 to 30 seconds or more for the sake of a smooth transfer if necessary. The onboard weight of the concept servos was more than offset by the ability to exchange cartridges twice during a record attempt, significantly increasing the performance of the official "BE" series of land speed record cars. Some pretenders were not equipped with cartridge exchange - and those cars performed badly as a result, almost destroying the brand in the process. An injunction followed in an effort to prevent pretenders using the trademark for cars not equipped with the instant cartridge recharging system. 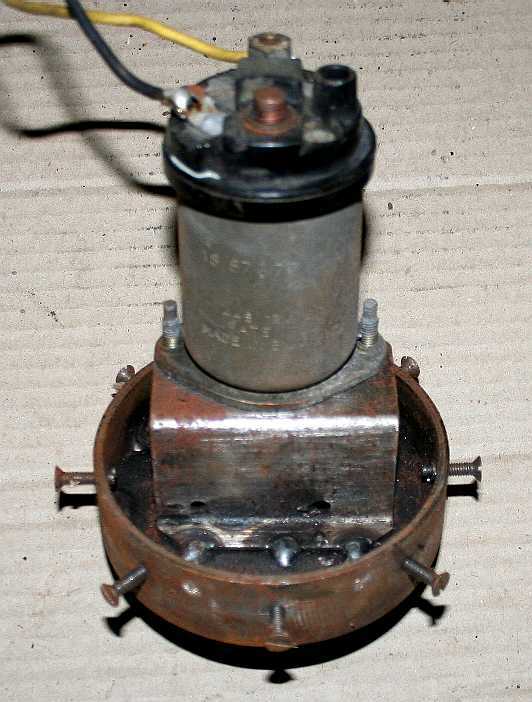 Another feature was rubber cone suspension very similar to that employed by Moulton for the British Leyland cars of the 1970s all the way to 2000, when BLMC and most of its derivatives ceased producing cars and the badge assets were sold off. In the BE1 - BE3 designs rubber springs were used in a different way to that employed in the Mini, for example. The BE1 used long thin pushrods from the live hub uprights (outboard) to the central chassis frame (inboard). This suspension design saved a lot more weight compared to coil springs. Coil springs in mass produced cars are of course cheaper to produce and less complicated to service. SERVO MAIN PARTS - Here you can see the six main lifting servo components that go to make up the front and rear cartridge exchange mechanism to provide instant recharging at the end of each land speed record run. Production servos would be less than half the weight of this robust steel prototype - which was nevertheless a clever conceptual design in 1991 when conceived and patented. Copyright photograph © 24 April 2017 all rights reserved. You will need the permission of Lime Park Heritage Trust to reproduce this picture except for educational use, private study or review. CARTRIDGES - This is the last of the three Bluebird-Electric 1 (BE1) battery cartridges to survive. Here you can see it newly prepared and primed. The battery cells have long ago been recycled leaving the casing - that one day may be loaded with lithium cells in a different format for the BE4 - but not for the BE1 that is now retired from active duty. Copyright photograph © 27 April 2017 all rights reserved. You will need the permission of Lime Park Heritage Trust to reproduce this picture except for educational use, private study or review. FIA APPROVED INSTANT RECHARGING - In this picture you can see the battery cartridge of the BE1 suspended from the pneumatic loading servos (in what would be the lowered position, save that the cartridge would have touched down by 60mm in this position and the hooks released) outside of the car to more readily appreciate the mechanics. Land speed record contenders are allowed three runs on the day of an attempt and may take the best two runs in opposite directions to calculate the average flying mile speed. Using cartridges that may be replaced quickly, the mass of the vehicle is reduced considerably compared to an electric vehicle that carries batteries for all three potential runs all of the time. This system was officially accepted by the FIA as refueling of the vehicle - so was permissible in the racing arena, such as Pendine Sands, the scene of Sir Malcolm's first triumphs, the Bonneville Salt Flats in the US where so many racers set their records today, or Lake Eyre in Australia, where Donald Campbell attained his LSR in the Ken Norris designed CN7. Such a system could improve the performance of track racing cars for the EV (Formula E) equivalent of Formula One, but is unlikely to get their attention, where most vehicle designers cannot get their head around built in loaders. Copyright photograph © 29 April 2017 all rights reserved. You will need the permission of Lime Park Heritage Trust to reproduce this picture except for educational use, private study or review. 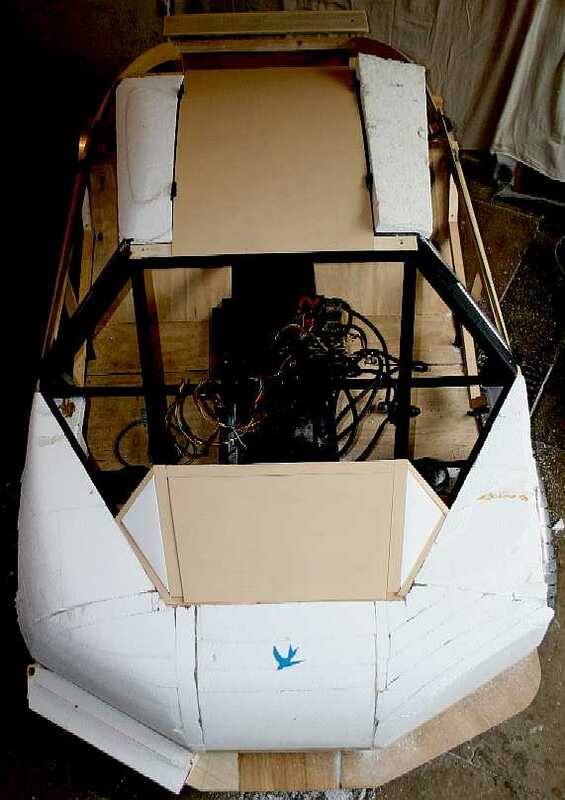 WIND TUNNEL - This is the last surviving of two wind tunnels that were built to test the aerodynamics of the BE1 and BE2 models, before construction of the full size frames and bodywork. The wind tunnel is made from substantial steel tubing for the support frame and curved aluminium for the tunnel walls. There is a large Perspex viewing chamber and a one horsepower fan. 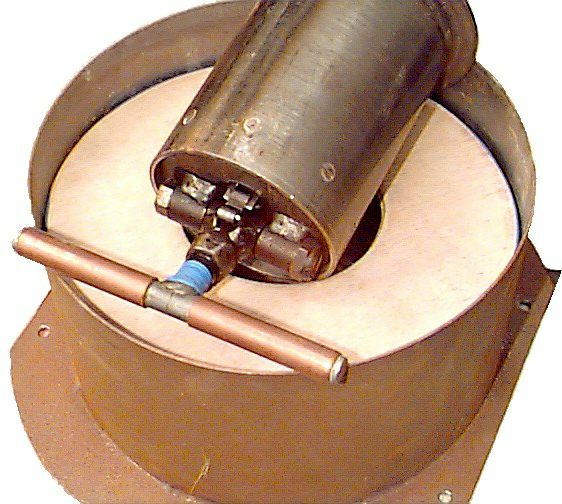 Measurement was by a five element strain gauge assembly with oil dampers and electronic strain-gauge amplification from RS. There is no corrosion to worry about but the aluminum could do with a makeover where the epoxy primer and subsequent matt black coatings clearly have different expansion ratios, and this instrument was for a time stored in a conservatory in the hot sun. Copyright photograph © 27 April 2017 all rights reserved. You will need the permission of Lime Park Heritage Trust to reproduce this picture except for educational use, private study or review. SHOWCASE - The BE2 seen at the top of the museum building, was the second car in the world to share the cartridge recharging system, using four pneumatic servos instead of two and a cartridge of twice the capacity of the BE1, but still with perfect weight distribution of the battery mass, a consideration that should perhaps be the starting point for any production vehicle. GULL WING - This incredibly compact electric car features gullwing doors and when fully loaded, four wheel drive and 300hp (200kW), making it potentially one of the fastest electric road cars. It was designed to commemorate the 50th anniversary of Donald Campbell's double achievement in 1964, taking land and water speed records in the same year. Copyright photograph © July5 February 2017. You will need the permission of the Lime Park Heritage Trust to be able to use these pictures, except for educational and use and private study. The BE3 was to have been a 400 mph machine to challenge the 300 mph+ record held by the Buckeye Bullet in the US. It had an extremely light stainless steel frame due to the cartridge recharging design and ideal weight distribution. The machine was not completed because by this time electric land speed record attempts were no longer the corporate draw of yesteryear, making sponsorship funding difficult to find, mainly because of the lackluster performance of the two pretender cars - that were of course nothing to do with the engineer who had conceived the concept and who had spent a small fortune promoting this ground breaking system under the BlueBird brand name. Instead of a hands on approach, the inventor made the intellectual property available to third parties, with just steerage provided on a free basis, if it was needed. CARBON FIBRE EV - The BMW i3, previously known as the Mega City Vehicle (MCV), is a five-door urban electric car. The i3 is part of BMW's "Project i" and was launched as a new brand, BMW i. The i3 is BMW's first zero emission mass-produced vehicle due to its electric power train. 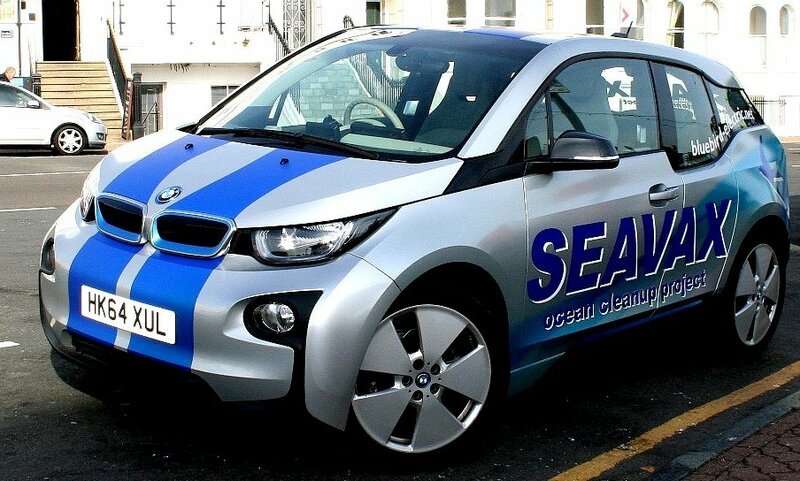 This car is now available with a 33 kW/hr battery pack and a 650cc IC generator onboard as a range extender. The ultimate range extender would be cartridge exchange recharging, but the challenge with that concept is enormous, mainly because it would require most of the auto makers to agree a format for a standard cartridge unit. Who has the funds to negotiate that particular deal and why bother when there is plenty of oil still to burn? Copyright photograph 1 November 2016 Bluebird Marine Systems Ltd, all rights reserved. You will need the permission of BMS Ltd to reproduce this picture. The BE4 departed from the land speed record theme, taking the cartridge recharging concept onto everyday tarmac. The idea of this machine built by Bluebird Marine Systems independently under license, was to set distance Vs time records from famous locations like Lands End to John o'Groats. 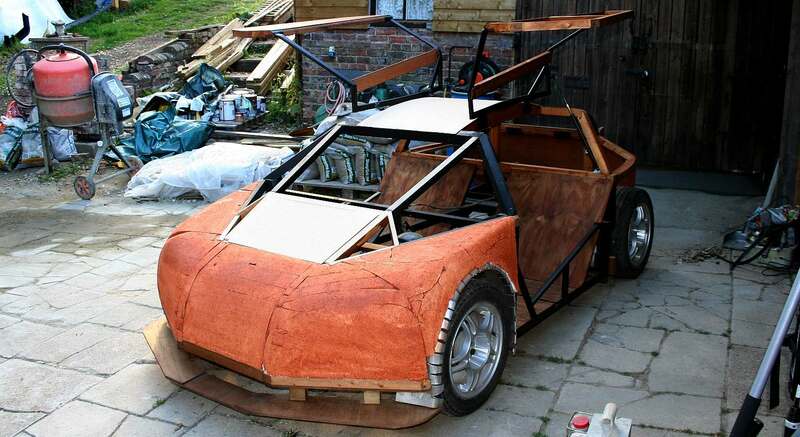 This project car is not being developed any longer by Bluebird Marine and we have been asked to provide a home for it until such time as the world is ready for electric cars that are able to travel long distances without having to wait in between charges. That could be a long time. As has been pointed out, companies who develop concepts that are too far from market soon get swallowed up by operating overheads, and sometimes bought out by the competition to keep disruptive technology from market. It is better to quit at the concept stage and write those costs off under the marketing or research and development (R&D) banners. What a pity for global warming and the circular economy that many countries are now chasing. The good news is that BMW and other car makers are slowly moving forward with EV development. Just remember where you saw cartridge exchange first and think of paying a visit to Sussex once in a while, to see where it all began. BE4 GULL WING SPORTS CAR - This car, also on display at the Museum (with kind permission), was built by Bluebird Marine Systems under licence between 2014 and 2015, but work on the bodywork has since been mothballed in favour of other projects that are more pressing or economically viable, or both. 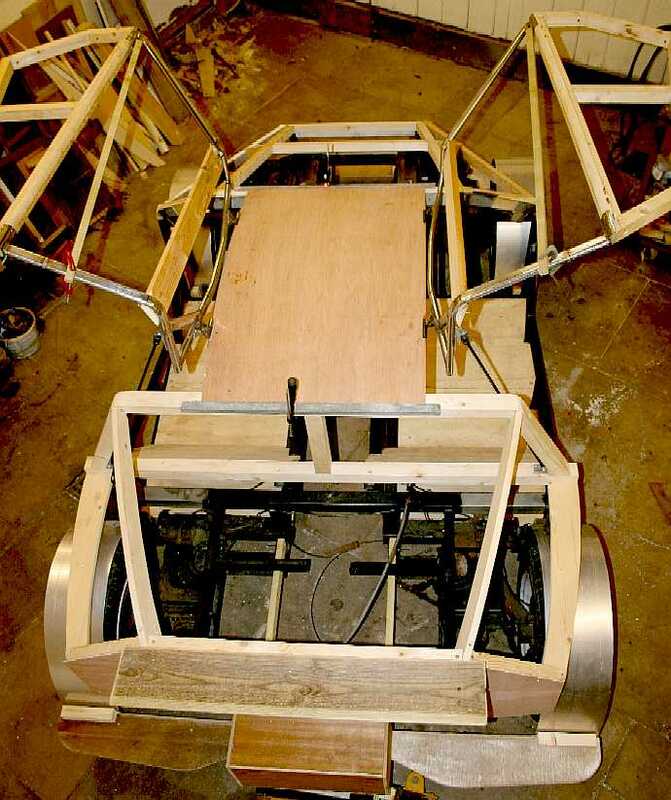 This extremely fast car does not use pneumatic servos, but is designed for an electro-mechanical lifting device that is relatively flat (low profile) by comparison to the upright cylinders seen above. Copyright photographs © BMS Ltd all rights reserved. You will need the permission of Bluebird Marine Systems to reproduce any of these pictures except for educational use, private study or review. 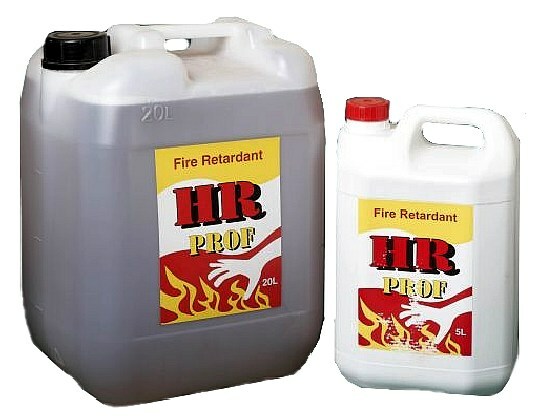 FIRE RETARDANT - HR-Prof has non-flammable properties, which become part of the substrate, restricting ignition and the spread of flame. It will not wash out from the surface of the substrate after drying, it is not converted into smoke when exposed to high temperatures, and carbon char is restricted to the immediate area. Materials treated with HR-Prof when exposed to temperatures of up to 1700 C are subject to charcoal forming, severely restricting the spread of flame. Apply three coats at one hour intervals. HR-pro can be overcoated. 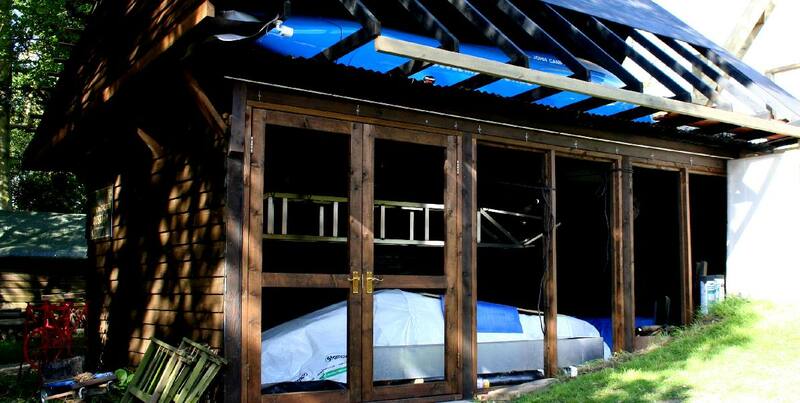 HR-Prof for use in timber frame buildings, external wood cladding, on staircases, trusses, doors, joists, floors and walls, on stables, log cabins, boats, fencing and garages – inside and outside. Once dry it is not affected by moisture so can also be used in kitchens, bathrooms, saunas and swimming pool enclosures. Timber pre-treated with HR PROF (Holz Prof) once dry does not react with galvanised steel ( zinc), stainless steel, brass, gun nails or zinc coated screws, whether the application is internal or external. HR-Prof is simple to use and safe to apply. Possessing high diffusion properties it quickly penetrates the structure of the substrate. 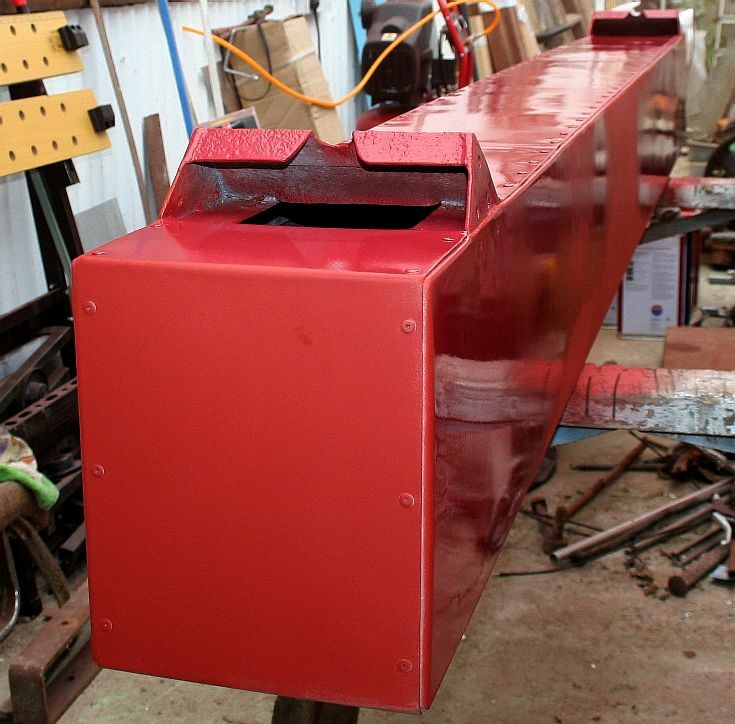 Unlike intumescent systems it does not require an additional protective finishing coat. However, if required HR-Prof can be over-coated with wood stains, varnishes and some paints (tests may be required before over-coating). BUILDING REGULATIONS - For building control purposes Euroclass Certifications are now formally incorporated into Approved Document B which is readilly available on the government web site, office of the Deputy Prime Minister as a PDF document. To download a copy click on this weblink: http://www.planningportal.gov.uk/uploads/br/BR_PDF_ADB_2000.pdf HR-Prof certification is to BS EN 13823 & BS EN 11925-2 SBI Euro class B-sl-d0 (Equivalent to UK Class O BS476 & BS 476: Part 7) Euro-class C (Equivalent to UK Class 1 & 2) for plywood. 1. Multi Surface Paint MSP an Acrylic non-flame propagating, fast drying, top coat paint ideal for use after application with HR PROF (Holz Prof) fire retardant, available in Gloss, Matt and Satin or any RAL or BS colour subject to economical batch size. 2. Barn Paint Wood Stain an Acrylic non-flame propagating Stain, ideal for External use over HR Prof.
3. Floor Paint an Acrylic non-flame propagating, slip resistant, hard wearing top coat paint ideally suited for use over HR Prof.
Herstmonceux Museum, including Campbell Hall, is run by the Lime Park Heritage Trust and other Trusts working together to conserve our heritage. We had planned to open the site to the public, but this is no longer possible with Wealden District Council pressing us for additional costs that would burden us unduly. The good news is that in the digital age we hope to be able to offer a virtual tour of the site and exhibits once funding is achieved.